The global maritime industry is on the path to revival, with key players adopting structural changes to maximise operational efficiencies through innovative solutions and strategic partnerships. Leading players within the industry are cautiously optimistic about the revitalisation of oil prices and its overall impact on the shipping and logistics business. As governments are diversifying their economies, fuelling further growth into the marine sector, UAE-based Centena Group is expanding its marine division across key markets. The Group is targeting rising new economies and establishing its presence in India, Sri Lanka and most recently, Singapore and Saudi Arabia. Sanjay Raghunath, Chairman and Managing Director of the Centena Group, has been spearheading the company's growth strategy. "Our expansion into Singapore is aimed at entering a number of new markets in the region. Indonesia and Vietnam especially offer immense potential for growth within South East Asia," says Raghunath. In early 2018, Centena started operations out of Singapore, a strategic center for the maritime business in Asia. Boasting more than 4,500 vessels registered with the Singapore Registry of Ships (SRS), the top bunkering harbour is a gateway to 600 seaports in over 120 countries. "As for Saudi Arabia," Raghunath continues, "the opportunities opening up in this market offer great prospects for growth." With Saudi Arabia's maritime sector receiving a much-needed cash boost of 33 billion SR, the marine sector in the Kingdom is expected to see revenues increase to SR975 billion in 2019. Saudi Marine Engineering Technologies (SMET), the Saudi arm of Centena's Marine division, will be fully operational by the end of the first quarter this year." "The next step for us will be to enter the European market," adds Raghunath. Maritronics has been at the forefront of providing cutting edge marine solutions in the Middle East & Indian subcontinent. 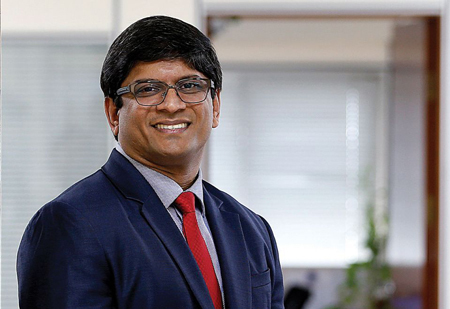 "What makes us different is the level of service that we provide - the competent engineers and technicians that we have, our understanding of the marine and offshore markets; these enable us to provide optimal solutions to our customers, be it for new builds or retrofits," says Philip Cherian, CEO of Maritronics, who will also be heading the SMET division in Saudi Arabia. The success of Maritronics - Centena's marine division in the UAE - is due in part to a satisfied clientele making for repeat business while also attracting new customers consistently. For Centena, the establishment of a division in a new market paves the way for an expansion for the rest of the Group. ATLAB, the educational division of Centena, has been working to implement STEAM-based education and training through its teaching modules and ATLAB Stem Academy, while partnering with global firms such as LEGO education, SAM Labs, PITSCO Education, PASCO Scientific, and KUBO. ScreenCheck is transforming the access control and security landscape, introducing advanced solutions from CMI Tech, Suprema, Impinj and Tiso among others, that are capable of predictive monitoring and analytics. The Group's Industrial Automation and Life Analytical Sciences divisions have been at the forefront of promoting process automation and improving the standards in diagnostics, life science research, food, ecology and industrial testing, respectively.